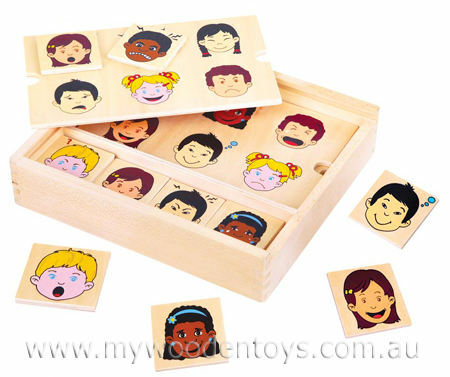 Matching Expressions Wooden Game is a fantastic educational observation game. The set consists of four wooden cards with six faces with different expressions on them. There are also 24 tiles which match exactly the expressions on the four wooden cards. The idea is to match the expressions on the tiles with the expressions on the cards. This game can be played in many different ways and can help small children explore how they are feeling. This toy can be a very useful when a child has difficulty talking about how something makes them feel. The faces are of children of different races, hair and eye colours and are simple and engaging. This game is presented in a strong box which has compartments and a sliding lid. We like this because: "Great game well presented in a sturdy box."